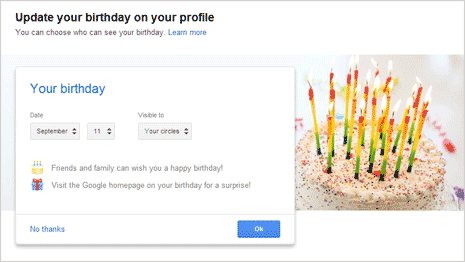 Did you see pop-up box for updating your Birthday date information on your Google+ profile? 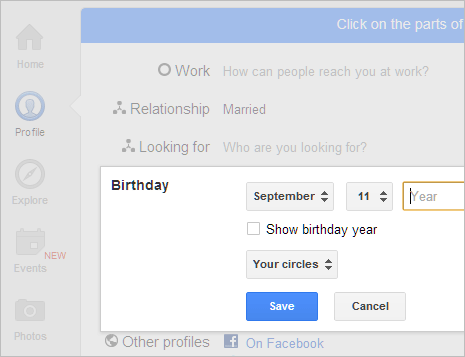 You can easily add, remove or hide birthday date details on Google+ Plus account information page. Once you add birthday date information, your friends and family members on Google+ can easily send you Birthday wishes. Visiting Google homepage on birthday date with show surprise birthday message to you. Birthday information also come handy for Google+ to provide you with features like age-appropriate settings when you use Google services and personalized content. 1. Direct method to update Birthday details – Once you login into your Google+ Plus profile, open [plus.google.com/up/birthday] URL to view pop-up box for entering birthday date information. Besides selecting month and date – you can also select circles to whom birthday date details will be visible. 2. Edit profile information – For more setting like entering birthday year and hiding it – you need to access profile settings. Open your Google+ profile and click ‘Edit Profile’ button. Scroll down and click on Birthday listing section. Here you can edit to change or remove birthday information. You can also hide your age information by un-checking (no tick) “show birthday year” box. Make sure you select required circle for better privacy controls. Also, if birthday details are already added to your associated Google account profile, same will be carried to your Google+ Plus profile. How to disable Google search wiki arrow & cross?